Long Beach, Southern California – Al Jazeera’s Investigative Unit has discovered that a self-deleting messaging app called Tiger Text has been adopted by at least one US police department, which may have used it to share sensitive and potentially incriminating information that they wouldn’t want to be disclosed to a court. Current and former officers from the Long Beach Police Department in Southern California have told Al Jazeera that their police-issued phones had Tiger Text installed on them. The Tiger Text app is designed to erase text messages after a set time period. Once the messages have been deleted, they cannot be retrieved – even through forensic analysis of the phone. The police officers who spoke with Al Jazeera said the confidential messaging system was used to share details of police operations and sensitive personnel issues. Two of the officers claimed that they were also instructed by their superiors to use the app to “have conversations with other officers that wouldn’t be discoverable”. 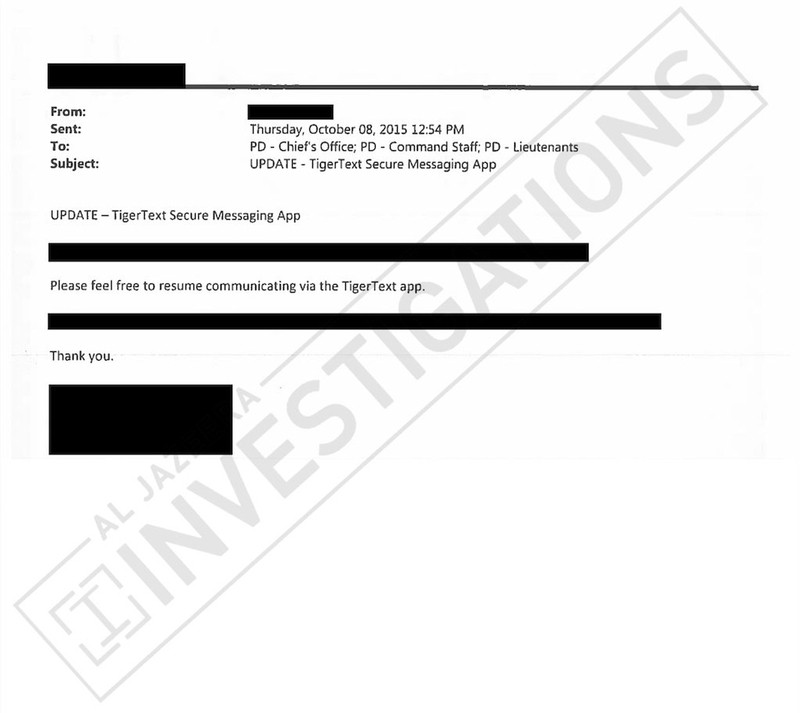 An internal email obtained by Al Jazeera shows that the Tiger Text program was widely used by LBPD. This note sent in 2015 went out to all Lieutenants, Command Staff and the Chief’s Office. They said they understood this to include exculpatory evidence that could be potentially helpful to attorneys in both civil and criminal proceedings against the department. It’s a claim that the Long Beach Police Department denies. But the officers say they were not surprised by the instructions, claiming that the discovery process within the police department was never on the “up and up”. “I find it odd that we have a communication system that circumvents everything that we are supposed to be doing,” said one officer who is still with the department. According to the research group Mapping Police Violence, the Long Beach Police Department ranked fifth in the nation for officer-involved shootings per capita in 2015. Civil rights lawsuits have resulted in the city of Long Beach paying out tens of millions of dollars to the families of those shot. One former police officer said he suspects this is what motivated the department to adopt the application. “There have been a number of officer-involved shooting cases that have hurt the department,” he said. Mohammad Tajsar, a lawyer with the ACLU of Southern California, told Al Jazeera that he was shocked by the officers’ claims. “If the department brass instructed members of the force to use Tiger Text to shield from the public the disclosure of sensitive messages about investigations into police killings, then this is an institutional cover-up of the highest order, designed to protect a department that is notorious for killing people,” Tajsar said. 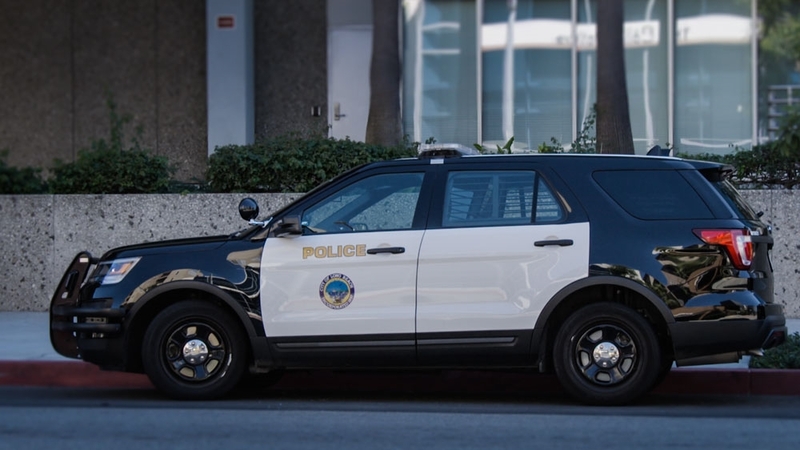 Al Jazeera obtained financial records from the Long Beach Police Department that indicate that the Tiger Text system has been in place since at least 2014, with over 100 police personnel using the app. 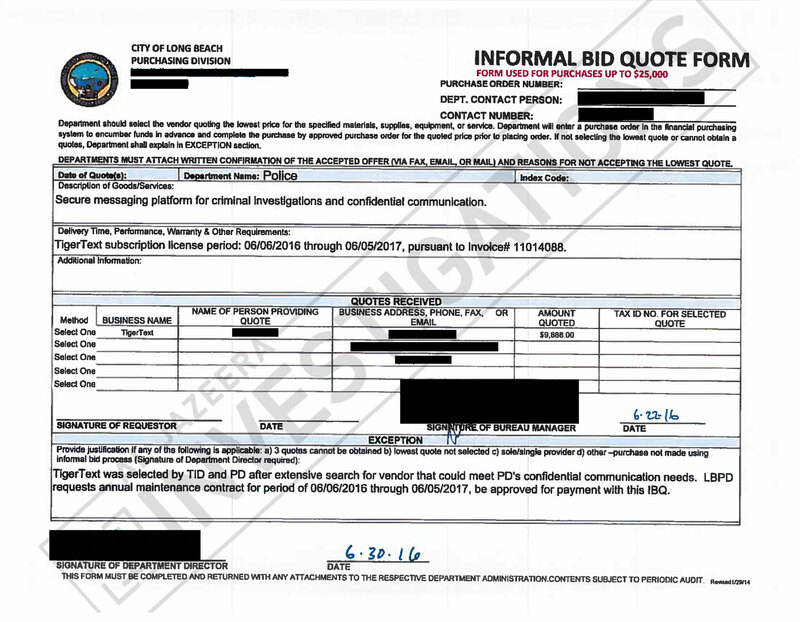 An invoice from 2016 shows the city of Long Beach spends around $10,000 USD each year for the text messaging platform. One document from the City of Long Beach Purchasing Division describes the app as “a secure messaging platform for criminal investigations and confidential communications”. All the officers Al Jazeera spoke to asked that their identity be kept confidential for fear of reprisals from the police department. They say that the Tiger Text app was set to delete messages after a few days and that it was distributed to officers in specialised details and to all senior officers above the rank of lieutenant. The ACLU believes that, by using the app, the Long Beach Police Department could be breaking laws that require the preservation of records and the rules that require their disclosure during legal cases, potentially putting thousands of court verdicts at risk. Al Jazeera’s investigation into the use of Tiger Text found that the Georgia Department of Corrections also began using the application in 2013. But lawyers for the department quickly decided that its use would likely violate Georgia law, possibly breaching the state’s records retention legislation and most likely leading to court discovery violations. One Long Beach police officer told Al Jazeera that while he was working within the Department, he witnessed Tiger Text being used during an investigation into the police shooting of Jason Conoscenti in the Alamitos Beach neighbourhood in 2014. The officers involved in the shooting were cleared of any wrongdoing after prosecutors found insufficient evidence to bring charges. Al Jazeera spoke to several lawyers who have litigated against Long Beach. None were aware of the police department’s use of the Tiger Text app. In response to AJ Jazeera’s investigation, Long Beach Police Department said it “complies with all laws related to discovery, and any information relevant to a specific investigation would be documented and provided according to legal requirements”. The department said it uses the Tiger Text application “to communicate confidential crime scene information, victim information, and personnel matters between department management personnel, as well as employees in specialised details”. Joanna Schwartz, an expert on police litigation at the UCLA School of Law believes it is difficult to predict the legal problems that the use of a self-deleting app will bring for the Long Beach Police Department.